J. R. Cash (February 26, 1932 – September 12, 2003), better known as Johnny Cash, was an influential American country and rock and roll singer and songwriter. Cash was the husband of country singer and songwriter June Carter Cash. Cash was known for his deep and distinctive voice, the boom-chick-a-boom or "freight train" sound of his Tennessee Three backing band, and his dark clothing and demeanor, which earned him the nickname "The Man in Black." He started all his concerts with the simple introduction "Hello, I'm Johnny Cash." 5 "The Man in Black"
Johnny Cash sold over 50 million albums in his nearly 50-year career and is generally recognized as one of the most important musicians and recording artists in the history of American popular music. Johnny Cash was born J. R. Cash in Kingsland, Arkansas, and raised in Dyess, Arkansas. By age five, he was working in the cotton fields, singing along with his family as they worked. The family farm was flooded on at least one occasion, which later inspired him to write the song “Five Feet High and Rising” (Cash 1997). His older brother Jack died in a tragic on-the-job accident, working a high school shop table saw, in 1944 (Cash 1997). His family's economic and personal struggles during the Depression shaped him as a person and inspired many of his songs, especially those about other people facing personal struggles. Cash's early memories were dominated by gospel music and radio. He began playing guitar and writing songs as a young boy and in high school sang on a local radio station. Decades later, he would release an album of traditional gospel songs, called My Mother's Hymn Book. Irish music that he heard weekly on the Jack Benny radio program, as performed by Dennis Day, influenced him greatly (Gross 2006). He was reportedly given the name J. R. because his parents could not agree on a name, only on initials. (Giving children such names was a relatively common practice at the time.) When he enlisted as a radio operator in the United States Air Force, the military would not accept just initials as his name, so he adopted John R. Cash as his legal name. When he signed for Sun Records in 1955, he took "Johnny" Cash as a stage name. His friends and in-laws generally called him John, and his blood relatives often called him J. R.
After basic training at Lackland Air Force Base and technical training at Brooks Air Force Base, both in San Antonio, Cash was sent to a U.S. Air Force Security Service unit at Landsberg Air Base, Germany. There, he founded his first band, the Landsberg Barbarians. After his term of service ended, Cash married Vivian Liberto, whom he met while training at Brooks. In 1954, he moved to Memphis, Tennessee, where he sold appliances while studying to be a radio announcer. At night, he played with guitarist Luther Perkins and bassist Marshall Grant (together known at first as the Tennessee Three). Cash worked up the courage to visit the Sun Records studio, hoping to garner a recording contract. After auditioning for Sam Phillips, singing mainly gospel tunes, Phillips told him to "go home and sin, then come back with a song I can sell." Cash eventually won over Phillips with new songs delivered in his early frenetic style. His first recordings at Sun, “Hey Porter” and “Cry Cry Cry” were released in 1955, and met with reasonable success on the country music hit parade. Cash's next record, Folsom Prison Blues, made the country top 5, and “I Walk the Line” was mumber one on the country charts, making it into the pop charts’ top 20. Following “I Walk the Line” was Johnny Cash's “Home of the Blues” recorded in July 1957. In 1957, Cash became the first Sun artist to release a long-playing album. Although he was Sun Record's most consistent, best-selling, and prolific artist at that time, Cash felt constrained by his contract with the small label. Elvis Presley had already left Sun, and Phillips was focusing most of his attention and promotion on Jerry Lee Lewis. The following year, Cash left the label to sign a lucrative offer with Columbia Records, where his single “Don't Take Your Guns to Town” would become one of his biggest hits. Cash's first child, a daughter, Rosanne, was born in 1955. Although he would have three more daughters (Kathleen in 1956, Cindy in 1959, and Tara in 1961) with his first wife, they divorced in 1966, due to his constant touring. It was during one of these tours that he met June Carter, whom he would later marry in 1968. As his career was taking off in the early 1960s, Cash began drinking heavily and became addicted to amphetamines and barbiturates. For a brief time, Cash shared an apartment in Nashville with Waylon Jennings, who was also heavily addicted to amphetamines. Cash used the uppers to stay awake during tours. Friends joked about his "nervousness" and erratic behavior, many ignoring the signs of his worsening drug addiction. Although he carefully cultivated a romantic outlaw image, he never served a prison sentence, though he landed in jail seven times for misdemeanors, each stay lasting a single night. His most serious and well-known run-in with the law occurred while on tour in 1965, when he was arrested by a narcotics squad in El Paso, Texas. Although the officers suspected that he was smuggling heroin from Mexico, he was actually smuggling amphetamines inside his guitar case. (One report said that he was carrying a total of 1,163 pills.) Because they were prescription drugs, rather than illegal narcotics, he received a suspended sentence. After he quit using drugs in the early 1970s, Cash rediscovered his Christian faith, taking an "altar call" in Evangel Temple, a small church in the Nashville, Tennessee area. Cash chose this church over many other larger, celebrity churches in the Nashville area because he said he was just another man there, and not a celebrity. Cash felt great compassion for prisoners. He began performing concerts at various prisons starting in the late 1950s (Cash 1997). These performances led to a pair of highly successful live albums, At Folsom Prison in 1968, and At San Quentin in 1969. The Folsom Prison record was introduced by a powerful rendition of his classic "Folsom Prison Blues," while the San Quentin record included the crossover hit single “A Boy Named Sue,” a Shel Silverstein-penned novelty song that reached number one on the country charts and number two on the pop charts. The AM radio versions of the latter contained a couple of profanities that were blipped out in that more-sensitive era. The modern CD versions are unedited and uncensored, and also longer than the original vinyl albums, giving a good flavor of what the concerts were like, with their highly receptive audiences of convicts. Apart from his performances at Folsom Prison and San Quentin, and various other United States correctional facilities, Cash also performed at Österåkeranstalten (The Österåker Prison) north of Stockholm, Sweden in 1972. The recording was released in 1973. Between the songs Cash can be heard speaking Swedish, which was greatly appreciated by the inmates. 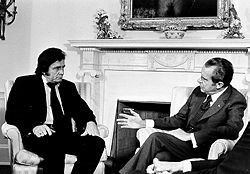 Cash advocated prison reform at his July 1972 meeting with U.S. president Richard Nixon. From 1969 to 1971, Cash starred in his own television show on the American Broadcasting Company network. The singing group The Statler Brothers got their start on the show, opening up for him in every episode. Notable rock artists also appeared on his show, including Neil Young, The Monkees, and Bob Dylan. Cash had been an early supporter of Dylan, even before they had met, but they became friends while they were neighbors in the late 1960s in Woodstock, New York. Cash was enthusiastic about reintroducing the reclusive Dylan to his audience. Dylan had taken an extended hiatus from performing following a near fatal motorcycle accident on Zena Woods Road near Woodstock in 1968. Cash coaxed Dylan back into the recording studio and sang a duet with Dylan on Dylan's country album Nashville Skyline, and also wrote the album's Grammy-winning liner notes. Another artist who received a major career boost from The Johnny Cash Show was songwriter Kris Kristofferson. During a live television performance of Kristofferson's “Sunday Mornin' Comin' Down,” Cash made headlines when he refused to change the lyrics to suit network executives, singing the song with its controversial references to marijuana intact: "On the Sunday morning sidewalks / Wishin', Lord, that I was stoned." I wear the black for the poor and the beaten down, / Livin' in the hopeless, hungry side of town, / I wear it for the prisoner who has long paid for his crime, / But is there because he's a victim of the times. He and his band had initially worn black shirts because that was the only matching color they had among their various outfits (Cash 1997). He wore other colors onstage early in his career, but he claimed to like wearing black both on- and offstage. 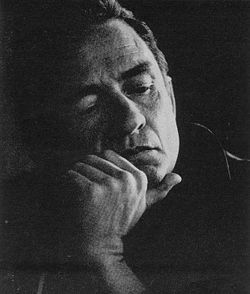 In the mid-1970s, Cash's popularity and hit songs began to decline, but his autobiography (the first of two) titled, Man in Black, was published in 1975 and sold 1.3 million copies. (A second, Cash: The Autobiography, appeared in 1997.) His friendship with Billy Graham led to the production of a movie about the life of Jesus of Nazareth, The Gospel Road, which Cash co-wrote and narrated. The decade saw his religious conviction deepening and he made many public appearances in an evangelical capacity. He also continued to appear on television, hosting an annual Christmas special on the Columbia Broadcasting System throughout the 1970s. Later television appearances included a role in an episode of the detective series Columbo. He also appeared with his wife on an episode of Little House on the Prairie, entitled "The Collection" and gave a stirring performance as John Brown in the 1985 American Civil War television mini-series North and South. He was friendly with every U.S. president beginning with Richard Nixon. He had little association with Bill Clinton and George W. Bush because of a personal distrust of both men and because of his declining health. He was closest with Jimmy Carter, who was actually a very close friend, but not related to his wife, June Carter Cash. None of these friendships were about politics, as he never particularly supported any administration, but was just friendly with the nation's leaders. He stated that he found all of them personally charming, noting that that fact was probably essential to getting oneself elected (Cash 1997). In 1980, Cash became the Country Music Hall of Fame's youngest living inductee at age 48, but during the 1980s, his records failed to make a major impact on the country charts, though he continued to tour successfully. In the mid-1980s, he recorded and toured with Waylon Jennings, Willie Nelson, and Kris Kristofferson as The Highwaymen, making two hit albums. During this period, Cash appeared as an actor in a number of television films. In 1981, he starred in The Pride of Jesse Hallam. Cash won fine reviews for his work in this film that called attention to adult illiteracy. In 1983, Cash also appeared as a heroic sheriff in Murder in Coweta County, which co-starred Andy Griffith as his nemesis. This film was based on a real life Georgia murder case; Cash had tried for years to make the film, which would win him acclaim. (Coincidentally, in 1974, Cash starred as a country singer killer in the Columbo movie, Swan Song.) Cash and his wife appeared on a number of episodes of the popular television series Dr. Quinn, Medicine Woman, starring Jane Seymour. The actress thought so highly of Cash that she later named one of her twin sons after him. Cash relapsed into addiction after a serious stomach injury in 1983, caused by a bizarre incident in which he was kicked and critically wounded by an ostrich he kept on his farm. He was administered painkillers as part of the recovery process, which led to the relapse (Keast 2001). During his recovery at the Betty Ford Clinic in 1986, he met and befriended Ozzy Osbourne (Cash 1997). At another hospital visit in 1988, this time to watch over Waylon Jennings (who was recovering from a heart attack), Jennings suggested that Cash have himself checked into the hospital for his own heart condition. Doctors recommended preventive heart surgery, and Cash underwent double bypass surgery in the same hospital. Both recovered, although Cash refused to use any prescription painkillers, fearing a relapse into dependency. Cash later claimed that during his operation, he had what is called a "near-death experience." He said he had visions of heaven that were so beautiful that he was angry when he woke up alive. His career was rejuvenated in the 1990s, leading to unexpected popularity and iconic status among a younger audience not traditionally interested in country music, such as aficionados of alternative rock and hip hop music. In 1993, he sang the vocal on U2's “The Wanderer” for their album Zooropa*. Although he was no longer sought after by major labels, Cash was approached by producer Rick Rubin* and offered a contract with Rubin's American Recordings label, better known for rap music and hard rock than for country music. Under Rubin's supervision, he recorded the album American Recordings (1994) in his living room, accompanied only by his guitar. The album featured several covers of contemporary artists, and saw much critical and commercial success. Cash wrote that his reception at the 1994 Glastonbury Festival was one of the highlights of his career. This was the beginning of a decade of music industry accolades and surprising commercial success. In 1996, Cash released a sequel, Unchained, and enlisted the accompaniment of Tom Petty and the Heartbreakers, which won a Grammy for Best Country Album. In 1997, Cash was diagnosed with the neurodegenerative disease Shy-Drager syndrome, a diagnosis that was later altered to autonomic neuropathy associated with diabetes. The illness forced Cash to curtail his touring. He was hospitalized in 1998, with severe pneumonia, which damaged his lungs. The albums American III: Solitary Man (2000) and American IV: The Man Comes Around (2002) contained Cash's response to his illness in the form of songs of a slightly more somber tone than the first two American albums. The video for “Hurt,” a cover of the Nine Inch Nails song, and generally recognized as his epitaph, from American IV received particular critical and popular acclaim. 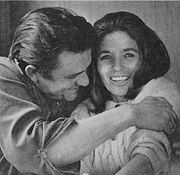 His wife June Carter Cash died of complications following heart valve replacement surgery on May 15, 2003, at the age of 73. June had told Cash to keep working, so he continued to record, and even performed a couple of surprise shows at the Carter Family Fold outside Bristol, Virginia. His final public appearance was on July 5, 2003. At a June 21, 2003, concert, before singing “Ring of Fire,” Cash read a statement shortly before taking the stage about his late wife. He spoke of how June's spirit was watching over him and how she had come to visit him before going on stage. He barely made it through the song. Despite his health issues, he talked of looking forward to the day when he could walk again and toss his wheelchair into the lake near his home. Less than four months after his wife's death, Johnny Cash died at the age of 71 due to complications from diabetes, which resulted in respiratory failure, while hospitalized at Baptist Hospital in Nashville, Tennessee. He was interred next to his wife in Hendersonville Memory Gardens near his home in Hendersonville, Tennessee. On May 24, 2005, Rosanne Cash's birthday, Vivian, his first wife and mother to Rosanne, died from surgery to remove a lung. In June of 2005, his lakeside home on Caudill Drive in Hendersonville, Tennessee, went up for sale by the Cash estate. In January 2006, the house was sold to a corporation owned by Bee Gees’ vocalist Barry Gibb for $2.5 million. The listing agent was Cash's younger brother Tommy. One of Johnny Cash's final collaborations with producer Rick Rubin, entitled American V: A Hundred Highways, was released posthumously on July 4, 2006. The album debuted in the number 1 position on Billboard Magazine's Top 200 album chart the week ending July 22, 2006. The vocal parts of the track were recorded before Cash's death, but the instruments were not recorded until late 2005. American VI is expected to be released in mid-2007. From his early days as a pioneer of rockabilly and rock and roll in the 1950s, to his decades as an international representative of country music, his resurgence to fame as both a living legend and an alternative country music icon in the 1990s, Cash has influenced countless artists and left a body of work matched only by the greatest artists of his time. Upon his death, Cash was revered by many of the greatest popular musicians of his time. Cash nurtured and defended artists on the fringes of what was acceptable in country music, even while serving as the country music establishment's most visible symbol. At an all-star concert in 1999, a diverse group of artists paid him tribute, including Bob Dylan, Chris Isaak, Wyclef Jean, Norah Jones, Kris Kristofferson, Willie Nelson, and U2. Two tribute albums were released shortly before his death; Kindred Spirits contains works from established artists, while Dressed In Black contains works from many lesser-known artists. In total, he wrote over a thousand songs and released dozens of albums, a box set, titled Unearthed, was issued posthumously. It included four CDs of unreleased material recorded with Rubin, as well as a Best of Cash on American retrospective CD. In recognition of his lifelong support of SOS Children's Villages, his family invited friends and fans to donate to that charity in his memory. He had a personal link with the SOS village in Diessen, at the Ammersee-Lake in southern Germany, near where he was stationed as an American GI, and also with the SOS village in Barrett Town, by Montego Bay, near his holiday home in Jamaica. Thus, the Johnny Cash Memorial Fund was founded to aid the above causes. Cash received multiple Country Music Awards, Grammy Awards, and other awards, in categories ranging from vocal and spoken performances to album notes and videos. In a career that spanned almost five decades, Cash was the personification of country music to many people around the world, despite his distaste for the Nashville mainstream. Cash was a musician who was not tied to a single genre. He recorded songs that could be considered rock and roll, blues, rockabilly, folk music and gospel music, and exerted an influence on each of those genres. Moreover, he had the unique distinction among country artists of having "crossed over" late in his career to become popular with an unexpected demographic, indie and alternative rock fans. His diversity was evidenced by his presence in three major music halls of fame: the Nashville Songwriters Hall of Fame (1977), the Country Music Hall of Fame (1980), and the Rock and Roll Hall of Fame (1992). Only ten performers are in both of the last two, and only Hank Williams Sr. and Jimmie Rodgers share the honor with Cash of being in all three. His pioneering contribution to the genre has also been recognized by the Rockabilly Hall of Fame as Inductee #115. He received the Kennedy Center Honors in 1996. Cash stated that his induction into the Country Music Hall of Fame in 1980 was his greatest professional achievement (Cash 1997). Cash, Johnny. 2000. Love. Liner notes written with June Carter Cash. New York: Sony. “Johnny Cash Dead At 71.” MTV. Keast, James. 2001. Johnny Cash: The Rebel. Retrieved September 7, 2004. Miller, Bill. JohnnyCash.com. Retrieved September 7, 2004. Peneny, D. K. Johnny Cash. The History of Rock and Roll. Retrieved September 7, 2004. Streissguth, Michael. 2004. Johnny Cash at Folsom Prison: The Making of a Masterpiece. Da Capo Press. ISBN 0306813386. Urbanski, Dave. 2003. The Man Comes Around: The Spiritual Journey of Johnny Cash. New York: Relevant Books. ISBN 0972927670. All links retrieved May 24, 2018. This page was last modified on 24 May 2018, at 15:26.